As this CD begins, with the introductory Allegro of the first movement of the Concerto No. 11 of this set, one has the impression of yet another early music group with a sharply etched profile of the music, but as the movement progresses—and morphs into the Adagio spiccato and the further, concluding Allegro—one hears much more in the way of phrasing and excellent changes of dynamics. 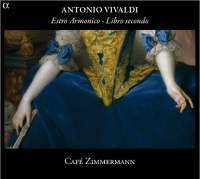 By the time one reaches the Largo e Spiccato movement, one realizes that Café Zimmermann is indeed one of those very rare historically-informed groups, like Tafelmusik and Fabio Biondi’s Europa Galante, that knows how to play this music with variance of touch and a real enjoyment of what they play. As a result, absolutely nothing on this splendid CD comes across as mechanical or “artificial”-sounding, as if created by MIDI or some other “music”-producing machine. Concerto follows concerto on this disc as the opening of so many buds into musical flowers, the fragrance of old Italy redolent in the exquisite elegance and at times delicate tracery of this group’s playing. In some of the suspended chords, such as the opening of the Adagio of the Concerto No. 7, Café Zimmermann holds the moment for a brief second or two, a Luftpause, that creates a feeling of anticipation and surprise. We know the chord will be resolved—that was, after all, the prescribed style of the time—but we have no idea how, and when the resolution comes, followed in turn by the joyous Allegro, we are surprised and delighted by what they find in this music. In fact, I am both happy and very proud of this group that they do not attack the music as if it were “Sing, Sing, Sing” or the latest Hip-Hop tune, as so many early music groups (sad to say, mostly Italian) do nowadays. Assisting them in their presentation of the music is the simply gorgeous recorded sound, which finds a perfect balance between harsh, grating sound and too much ambience. Thus I must give special thanks and praise to recording engineers Aline Blondiau and Hughes Deschaux, particularly to the former who also acted as artistic director and did the mastering of the disc. Café Zimmermann has rearranged the concertos in this set in order to achieve a better contrast of styles: Nos. 11, 7, 9, then the Cello Concerto in G followed by Nos. 10, 12, the violin-cello concerto in F (“Il Proteo o sia il Mondo al rovescio”), and ending up with No. 8 for two violins. It is in the Cello Concerto that I had my biggest complaint of the disc; the persistent use of straight tone makes the solo instrument sound rather colorless and in fact antithetical to the Italian style in general, but I’ve given up trying to convince these people that consistent straight tone is a modern-day affectation that has nothing to do with how the music was played in the 18th century. (I keep hoping against hope that some day they will all wake up and become heretics of the Religion of Straight Tone—somebody has to!) Fortunately, the overall playing of the group is good enough to overcome this tonal deficiency. I’m sure that many buyers of this album will want to play it as “brain food” for their babies once Mozart wears thin, or even worse, as musical wallpaper for their next highbrow brunch or dinner party, but if there be any really sensitive musical listeners attending these soirees I’m sure they will gravitate towards listening carefully to Café Zimmermann’s exquisitely shaped and molded performances and away from the small talk of the party. That’s how good this disc is. Highly recommended.